The facade of Pfingstkirche on Petersburger Str has the most chaotic, hack job-est design of any of the churches featured in this series, clearly the work of an architect deaf to Vitruvius’s mantra of “Firmness, Commodity and Delight”. 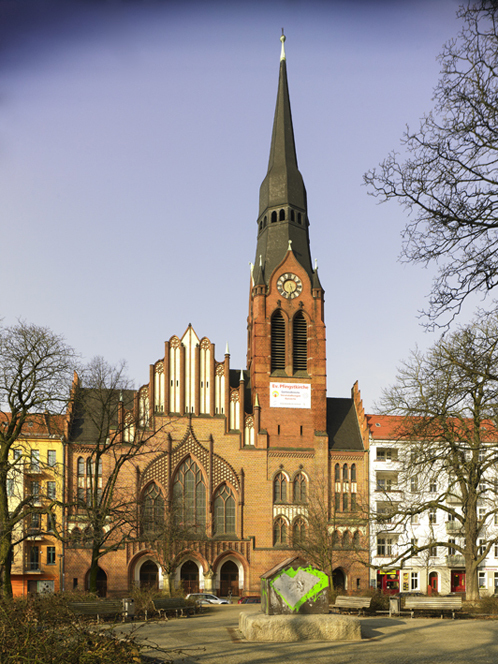 The guilty culprits were Jürgen Kröger und Gustav Werner, who purportedly designed it in a flamboyant late-gothic revival style. The Wikipedia entry for the church, going on and on in a manner might be termed preposterous neo-pedantic monotonism, gives an impossibly detailed description of something that can be simply understood to be ugly, banal and charmless. Looking at the facade so unwillingly, my eye is drawn to the strange house-like monument that stands before it. Its primitive form, coated with the dregs of neon-colored billpostings, exudes a raw, spontaneous energy that’s in stark contrast to the church’s insipid architectural contrivances. With this image we hereby draw to a close the publication of Victor Brigola‘s wonderful series of photographs of rowhouse churches. It is, I think, a fitting way to end. Ever since the project began, this image has been the can being kicked down the road, an ugly truth that I wanted to ignore. But in the end it has served as an inspiration, a testament to the fact that a beautiful picture can be taken of something that isn’t.